Tathāgata (Sanskrit; Pali «The one thus-come» or «The one thus-gone»; Chinese: 如來; Pinyin: Rú lái; Japanese: nyorai; Korean: yeo-rae) This is traditionally interpreted as «one who comes and goes in the same way (as the previous Buddhas)». Tathāgata is the name which the historical Buddha Sakyamuni (Siddhattha Gotama) used when referring to himself as recorded in the tripitaka of the Pali Canon. It highlights the unique (and ambiguous) ontological status of a fully enlightened being since such a one is beyond the categories of existence and non-existence; in fact beyond all signification. Tathāgatha is an important term in Mahāyāna, especially in terms of understanding the two types of lineage (textual transmission and realisation transmission) found in the Mahāyāna and Vajrayāna traditions. There may be small distinctions between Buddha and Tathagata: for example, in some Mahāyāna traditions, the following assertion is made. A Buddha turns the wheel of Dharma at a time when it has not been turned. In this context, there has only been one Buddha in this age, as any other Bodhisattvas who have realised omniscience have done so through his transmission of realisation. These Bodhisattvas are Tathāgatas, but they are not yet able to demonstrate as Buddhas (because the wheel of Dharma is already turned), and will have to wait until a suitable time and place occurs before they can manifest as Buddhas. The term Tathagata can be construed as tatha-gata or as tatha-agata. The former means thus-gone while the latter means thus-come, or, alternatively, gone-to-thusness and come-from-thusness. This distinction represents an important dichotomy in Buddhist doctrine related to the ideas of self-power and other-power. Tathagata as thus-gone implies that the Buddha was a pioneer and the task of the practitioner or devotee is to follow and imitate and, ultimately, achieve what Buddha achieved. 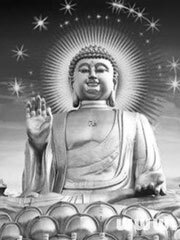 Tathagata as come-from-thusness, (Japanese: Nyorai) on the other hand, implies that the Buddha came to save us and give us refuge and that what is required of the practitioner is faith and devotion. If one considers the time when Shakyamuni Buddha was alive, there would be people of both kinds. The former would take what he taught as instruction and apply it by their own effort. The latter felt their lives changed almost involuntarily by his magnetic influence upon them. Broadly speaking, the Pure Land schools of Buddhism follow the latter approach. Many schools of Buddhism are, however, hybrids of the two approaches.